On Jan. 29, 1865, Captain Thomas Parker of Pennsylvania walked out into no-man's land along the Petersburg, siege lines. There, he met Lieutenant Colonel William Hatch of Kentucky. Both men were unarmed and under flags of truce. Hatch informed the dumbfounded Parker that three emissaries had just arrived from Richmond and wished to meet with President Abraham Lincoln to discuss terms for ending the war. Four days later, Lincoln, traveling alone, slipped into a carriage in front of the White House, bound for a fast steamer destined for Hampton Roads, at the mouth of the Chesapeake Bay. Only Secretary of State William Seward knew the purpose of Lincoln's clandestine sojourn. Thus began one of the most star-crossed secret missions of the Civil War, an audacious tale James B. Conroy tells with energy and eloquence. Conroy, a lawyer and former DC publicist and speechwriter, gives lie to the shibboleth that a thoroughly researched, abundantly footnoted, monograph can only be written in parched, overly academic jargon, by denizens of collegiate ivory towers. Our One Common Country swings out at a quick step pace with a narrative strategy that manages to incorporate a myriad of detail and analysis into a universe of uncommon suspense. It resonates with illustrative anecdotes, pithy turns-of-phrase, occasional hints of irony, and bon mons enough to fill a gossip column. It's a Civil War story that experts and novices will find riveting and revelatory. Rumors of a negotiated peace had been in the air at least since the summer of 1864 when influential Northern publisher Horace Greeley advised Lincoln to meet with Confederate agents on the Canadian side of Niagara Falls. The President declined. Re-elected in November 1864 and with the tide of battle turning in favor of the Union on every front, Lincoln was finally ready to do something no sitting President had ever done before or since: engage with the enemy in peace talks in the midst of a shooting war. That makes the meeting aboard the steamer River Queen on Feb. 3, 1865, a unique event in American history; an event that has, until now, escaped an in-depth investigation. Conroy sets up his drama by giving readers incisive character portraits of the drama's leading players. His description of Greeley is as priceless as it is accurate: eccentric, fickle, and powerful all at the same time. Conroy conveys the essence of Ulysses S. Grant in two clear, concise, unpretentious paragraphs, a fitting tribute to the man himself. Conroy lets Confederate Vice President Alexander Stephens' own Shakespearian rhetoric eloquently invoke his startling image: "Weak and sickly I was sent into the world with a constitution barely able to sustain the vital functions…But all these are slight when compared with the pangs of an offended and wounded spirit." Conroy needs only seven choice words to bring Radical Republican Congressman Thaddeus Stevens to life: "Richard III in a Prince Albert suit." The Hampton Roads conference was spawned in the quixotic imagination of the Francis Preston Blair Sr., the senior Democratic senator from Maryland with influential friends throughout the North and South. With Lincoln's permission, the old man traveled to Richmond with a fantastic proposal the wily politician had concocted but Lincoln had never backed. Nevertheless, Confederate government officials were interested, although President Jefferson Davis set conditions that insured its failure. So the peace conference process, possibly the worst kept secret of the war, staggered forward. Conroy describes it with melodrama worthy of a Stephen Spielberg film noir. The three Confederate peace commissioners, Assistant Secretary of War John A. Campbell, Senator Robert M. Hunter, and Vice President Alexander Stephens, expected to be received by General Grant and escorted to Washington. But Lincoln, a wily politician himself, had a different agenda. Congress was ready to consider the 13th Amendment to the Constitution prohibiting slavery and even a whiff of a negotiated peace might induce wavering Democrats to vote against it in hopes of ending the war without abolishing the "peculiar institution". While Congress debated, Lincoln connived to keep the peace emissaries far from The Capital. While they waited aboard the steamer Mary Martin, unaware of the machinations their visit had spawned, the Southern commissioners were treated like visiting royalty, replete with good food, cigars, and congenial conversations reminiscent of happier times. While the commissioners cooled their heels, the diplomatic game played by various Union participants turned downright byzantine. Lincoln sent a carefully worded letter to the commissioners with conditions for a meeting. The commissioners responded with a letter of their own. Each side chose its words carefully, sensitive to nuance and innuendo. The telegraph lines between City Point and Washington sizzled with rumors and hopes. The parties began to founder on Lincoln's insistence of "our one common country" and Davis' commitment to "two nations" as a basis for any discussion. The talks seemed doomed before they had begun. Finally Grant, so far frozen out of this campaign, entered the fray. He sent an impassioned telegram to Secretary of War Edwin Stanton, confident that Lincoln would read it, too. Lincoln was moved by Grant's sense of the commissioners' sincerity and agreed to a meeting and so informed Seward, already at Fort Monroe. No one kept a transcript of the four hour meeting but Conroy has clearly digested the recollections of all the participants. This allows him to recreate the diplomatic dance performed by the five old friends in dramatic tones befitting the grave issues discussed in the saloon of the River Queen. 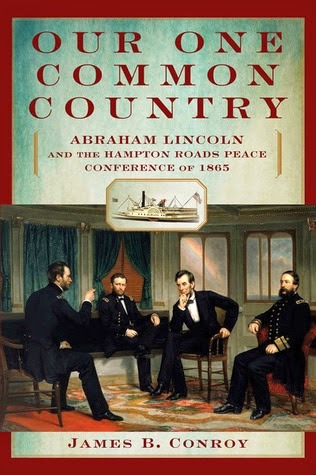 Through it all, Conroy contends, Lincoln's towering presence dominated the room. Ironically, it was on the issue of slavery that he held out the possibility for some measure of negotiation. Conroy reports Alexander Stephens recalling that Seward seconded the proposition that "A gradual end to slavery would be palatable if the war ended now and the South rejoined the Union freely. If not, the Thirteenth Amendment would end it abruptly, with the Southern states excluded from the process." But the commissioners, hide-bound by Jefferson Davis' delusions, had nothing to offer except a truce and possible renewal of trade. "It was far from good enough," Conroy concludes. Back in Washington, the cat was now out of the bag. Many Democrats praised Lincoln's efforts for peace and reunion; many Radical Republicans chided him for showing magnanimity to the enemy when on the verge of victory. But Lincoln could not let go of the possibility of ending the war. Conroy relates the extraordinarily generous but little known "Fellow Citizens of the Senate and House of Representatives" message written on February 5 that could have formed the basis of Lincoln's reconstruction policy had he lived. In it, he asked Congress to appropriate $400 million to compensate slaveholders and offered other lenient terms. Lincoln read it to the Cabinet. No one supported it. Saddened, Lincoln put it in his pocket, leaving his proposal to the judgment of history. Lincoln's offer would have probably fallen on deaf ears because, in Richmond, Jefferson Davis quickly demanded that his commissioners write a public report, leaving out anything positive that emerged from the meeting and to include absolute fabrications that vilified the Lincoln Administration. Davis hoped to use the "doctored" report to steel the resolve of the South to endure even greater sacrifices. He seemed determined to lead Southern citizenry into his own private "Gotterdammerung." Senator William Graham of North Carolina would conclude "there has been a very great duplicity towards a large portion of the Southern people displayed in this little drama." The war continued in all its ferocity. Conroy succinctly wraps up the final months of the war up to the assassination of Lincoln on April 14. As a final, dramatic, epilogue, he provides thumbnail sketches of the postwar fate of the drama's leading players. In the war's aftermath, Conroy poignantly quotes Confederate General Josiah Gorgas' May 4 diary entry. "I am as one walking in a dream, expecting to awake. I cannot see its consequences, nor shape my own course, but am just moving along until I can see my way at some future day." Because of the failure of the Hampton Roads Peace Conference, thousands of young men in blue and gray never had a chance to see their way at some future day.